KPSC Junior Trainee Officer (JTO) Hall Ticket 2018: Karnataka Public Service Commission (KPSC) Junior Training Officer written test is going to be conducted shortly. 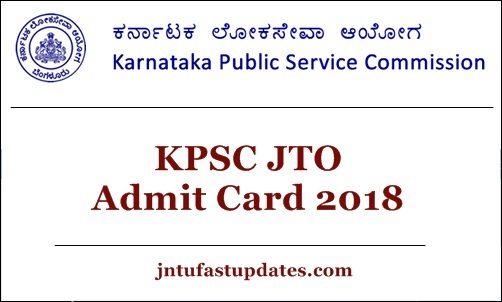 Aspirants applied for Karnataka JTO posts have to download KPSC JTO admit card to attend the test. The KPSC will conduct the Junior Training Officer examination in many examination centers across the state. By downloading the hall tickets, aspirants can check the details of their examination venue, date, and timings from it. The organization lets the candidates about the examination venue details through the hall ticket. Also, the candidate’s name, roll number/hall ticket number, date of birth, father’s name, signature, photograph and other details will be printed on the hall ticket. Aspirants can check all the details clearly once after downloading the hall tickets. For any sort of spelling corrections in name or other columns, candidates can contact the KPSC authorities through E-Mail or Phone. The helpline information will be available on KPSC official website, kpsc.kar.nic.in. Candidates appearing the test can also get their hall tickets from the same portal. Karnataka Public Service Commission is the state level government organization works to recruit manpower in its associated organizations. The Karnataka PSC annually rolls out various job notifications to hire the suitable aspirants into various posts. KPSC has recently announced 1520 Junior Training Officer (JTO) posts. A large number of aspirants from the state of Karnataka have responded and applied during the application dates. The screening will be done through the written test and interview rounds. Aspirants qualifying the screening tests with good merit will be considered for the announced posts. Aspirants applied for Junior Training Officer Posts can download Karnataka JTO Admit Card 2018 from KPSC portal, kpsc.kar.nic.in. The hall ticket/admit card is tentative to release before 10 days of the examination. Hopefuls applied for the posts can keep refreshing the page to get the admit card. It is the most important document to carry to the examination hall. The examination authorities will not let the aspirants carry on with the examination without showing the hall tickets. So, do not forget to carry the hall ticket while going to the examination. Along with the admit card, carry any of the Photostat copy of the identity certificate such as Aadhar Card/PAN Card/Passport/Driving Licence/Vote Card/Ration card or any other valid proof. Keep the hall ticket and identity proof at one place and carry those documents without fail. Kpsc.kar.nic.in is the KPSC official portal; from which the admit card can be accessible to download. After visiting the above page, search for the admit card download link for Junior Training Officer.